DEPENDABLE PERFORMANCE: These vacuum devices are pre-tested to assure maximum reliability. 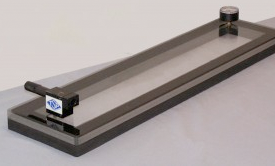 The designs have been thoroughly field tested for several years in a variety of applications. These vacuum boxes do not require a vacuum pump but employ the venturi effect using compressed air (plant site or compressor supplied) to evacuate air from inside the boxes. 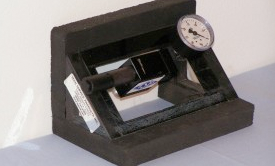 Each vacuum box is supplied with the air ejector assembly and a vacuum gauge. SIMPLE TO OPERATE: The air ejector has no moving parts and no lubrication is necessary. After applying leak detection fluid along seam, simply place the vacuum device over the area to be tested and open the air valve. 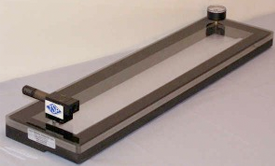 FAST, SAFE EVACUATION: Air ejection on standard models takes less than 30 seconds to reach a level of about 10 in/Hg. Our ejector is explosion proof. It uses no electricity. Your compressed air supply (60-120 psi) will insure safe, economical operation. CONNECTIONS: The air inlet on the venturi, which connects to the air hose is a 1/4″female NPT thread. 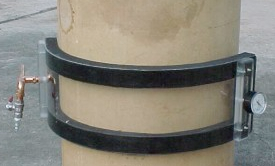 The inlet, which connects to the box is a 1/2″ female NPT thread. All connections are provided with the box including a quick disconnect. 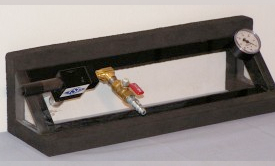 Any 3/8″ air hose will accommodate the box. These units are specifically designed for testing the inside corner (where the bottom meets the sidewall at 90 degrees) of storage tanks. For more information, please call us at 610-793-1700. © 2016 NDT International - All Rights Reserved.